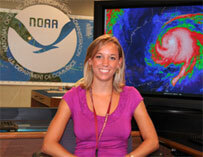 You are one of the fresh faces at the hurricane center. How did you find your way here? It was by default actually. I came to school at (the University of) Miami originally for marine science. I knew I loved the tropics, but I didn't know what I wanted to do with it. I thought marine biology, but I found out very fast that I did not like biology; it was not my subject. There was so much memorization, it just did not appeal to me. I was always good with math; I always loved weather, and especially severe weather. The first week of classes I was at UM was when Katrina came through, and I was fascinated. So I switched to meteorology during my first week of classes of my freshman year. I fell in love with it right there. I did not think that it would be my career path, but all of my talents just fell in together for it. I liked science, I liked math and I liked the weather! It was a perfect fit. You had the meteorology goal, but what about NHC? In my sophomore year, my advisor sent out an e-mail about internship opportunities, and one of them was here with the Storm Wallet project. I thought this might be a cool thing to apply for, which I did. So, I and another girl, Karina, both got internships working on the Storm Wallet project. From there, I kept getting e-mails about the Student Career Employment Program (SCEP) internship. I didn't know much about the program then, but applied for it and ending up getting it, not really knowing what I had fallen into. You applied for something that you didn't know what it was all about? I just knew it was another internship at NHC with this opportunity to get a job when I graduated. That's obviously a very appealing thing. But little did I know how competitive the program is. I didn't realize it until after I had gotten the internship of the opportunity that had landed in my lap. Now it has escalated into something I never would have imagined possible. How long were you in the SCEP program? It was a year and half. It is usually done in the senior year, but it was actually in my junior year that the SCEP student opening was available. It was a little longer than usual, but very enjoyable. You gave a presentation to NHC during this program. Is that typical? I don't know if other SCEPs do this, but I was given an applied research project working with tropical cyclone intensity estimates. It was looking at a method of estimation using the Advanced Microwave Sounding Unit (AMSU), which is the microwave sounder on polar orbiter satellites. I was looking to see if the estimates were valid. I took three years of data from 2005 through 2008 and compared the technique to the Dvorak technique that the forecasters in TAFB currently use. Was it better, the same, or not worth it? I did the analysis and gave a presentation here at NHC. Did you find that a bit intimidating? I did! The first time, I was extremely intimidated and nervous when I gave that presentation. And now, you are no longer a SCEP student. The program offers you the opportunity to take on an intern forecaster position when you graduate, if there is one. And the timing for me worked out absolutely perfect because TAFB had an intern forecaster position open within a couple weeks of my graduation date. A lot of times that does not happen, especially in this office. It happens more often in some of the local weather forecast offices, but here it is hit or miss when an opening and graduation correlates. I work on the surface analysis desk in TAFB. Every six hours we put out a unified surface analysis, which covers the Atlantic basin (including the Caribbean Sea and the Gulf of Mexico), and the Pacific basin. That's our area of responsibility and we coordinate with the Ocean Prediction Center, Hydrometeorological Prediction Center and the National Weather Service forecast office in Honolulu to create the analysis. So you are on shift work then. It is definitely the hardest thing to get used to, but now that I have been in it for a few months and I have gotten used to it, I am figuring out how my body adjusts to certain shifts and how to ease into and off of them. Now I am set in stone as to how to do things, but it is still a difficult way of treating your body. You were thrown into the deep end of the pool this past summer when you conducted one of the hurricane map briefings. That was pretty intimidating, especially being my first one. Luckily I had sat in on them for a few years from being around the office, and during the main hurricane season last year when they would have them every day. This year was once a week. So at least I got a little bit of a feel as to how they were run. Granted, I really didn't know where to find all of the products they were using and how to create the whole presentation. It was something new and I am glad to have had the experience and get a taste of it. That same project I worked on as a SCEP student became very large. As part of the University, you can do an honors thesis, which gives you general honors at the time of graduation. I figured I was already working on this project, so why not write it up into a paper. Granted, I didn't realize the workload that would come with it, but I did finish it. I submitted it to the American Meteorological Society and the National Weather Association for a student award. The requirement was a 10 page paper, so I had to do a lot of condensing, and won the NWA award. That was very exciting and I am very honored to have the award. I presented the paper in the form of a poster at the annual NWA meeting this past October. As a woman in meteorology, do you feel as if you are in an all-boys club? I do some of the time. Going to some of these conferences and seeing a lot more women at them, I don't feel as intimidated. I think it is becoming more prevalent. In my graduating class at UM, we were about half and half between men and women. Many people think women automatically go into broadcasting, but I think there is a rise in popularity for the science. How do you break through that? By being out there and telling people that I am doing something with meteorology that is not broadcasting, that it is not just a man's world anymore. Where do you see yourself going with this? I'd like to stick around here for now, moving up within the National Weather Service and gaining a forecaster position. My end-of-career goal is to do hurricane forecasting. But obviously I am still young and my path could be taken a million different ways. When you're not being a meteorologist, what gets you going? Fitness! I picked up running as a hobby, and I am training for the Miami Marathon. The other is cooking. I have always enjoyed it, and if I had to choose another field, I would become a chef.